This is my picture of Mango. A mango magnet. He's upside down. We are not going to break it. Mango thank you so very much. Its like our very own Olympic medal!!! Congrats! That is wonderful! AND it looks SO good on you two! Don't you just love it when the mailman brings you stuff? YIPEEEEEEEE !!! You got it in time to wear during the Closing Ceremonies Sunday night!! Wowie that is some super duper stuff you scored there!! I think that medal is 87% pure stuff!!! I'm just sayin'. Congratulations!!! Wow, you guys really are medal winners! Congrats and enjoy your prize! Though both of you wearing the medal at the same time can lead to a bit of trouble, yeah. Hehehe. I forgot how small you two are. Guess you can both wear it at once. Just no sudden moves, OK? We are stoked to have received ours today too! Congratulations! Now that's an award! Proud of you guys! Congrats, you guys! That medal looks great on you both. What pawesome awards from a pawesome khompetition! So I guess you two really were tied for the Mango's choice award! BOL! Congrats you two! Just adorable! Teehee! Most excellent medal! It looks great on you two! Congrats you guys! We're glad you didn't choke while mom took your picture! bol! OMG - you shared wearing the medal! The two of you are just the most adorable Frenchies! What cute pictures! Congratulations! TOTALLY cool, you guys! Congrats again! OMD I how could I have missed this post? I would have missed my chance to congratulate you again. 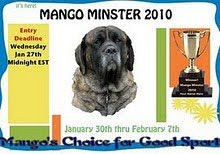 I sure loved the awards Mango came up with . What a great way to share you two! Congrats on the most excellent metal! What great sports to be sharing your medal!